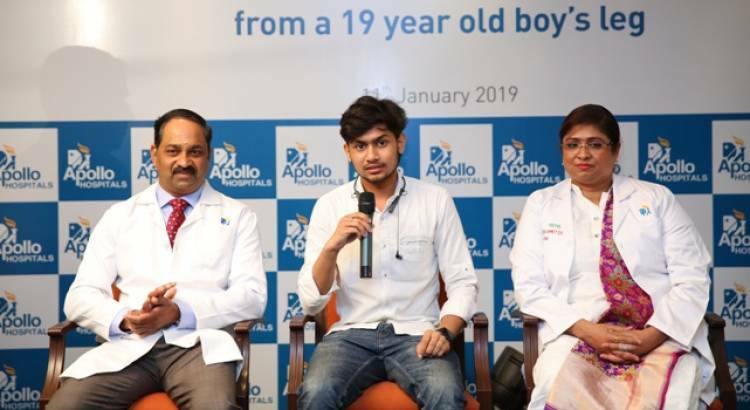 Surgeons at Apollo Hospitals, Asia’s largest most trusted multi-specialty chain of hospitals performed a rare surgery removing a cricket ball sized Desmoplastic Fibroma tumor from a 19 year old male patient’s ankle from Bangladesh. Instead of amputating the leg, the team comprising orthopedic, vascular and plastic surgeons saved the limb. Desmoplastic fibroma is a rare well-differentiated fibrous benign bone tumor which is locally aggressive but has potential for growth. The jawbone and the ankle is the most frequent site of this tumour’ s occurrence. It causes bone destruction with a tendency to invade the soft-tissues if left untreated. It has a high tendency for local recurrence if treated inadequately. Mrs. Rifat Iqbal, 19yrs from Bangladesh was brought to Apollo Hospitals Chennai with an unbearable swelling in his left leg making him immobile. Rifat Iqbal who was diagnosed with Desmoplastic fibroma tumour, earlier visited various specialized centers across the country. All the hospitals suggested to amputate the limb since the tumour was complex in size and destructing the ankle bone completely to an extent where the ankle bone was not evident in the X-ray. He approached Apollo Hospitals Chennai in 2017 for a Limb Saving procedure. A team of doctors including Dr. Kosygan, Senior Consultant Orthopedics Surgeon, Dr. Kannan Prema Senior Consultant Plastic & Regenerative Surgeon, Apollo Hospitals, and Dr.K. Shashibhushan, Senior Consultant Plastic & Microvascular Surgeon, Apollo Hospital, Dr. Ashok Parameswaran Senior Pathologist, Apollo Hospital, Chennai performed a wide resection of tumor and saved the limb. The patient is now stable with active ankle and toe movements and is now mobilized. The patient and his familywere extremely happy with the procedure and the team of doctors who performed the surgery. The patient is back to his regular academic without any hassle.